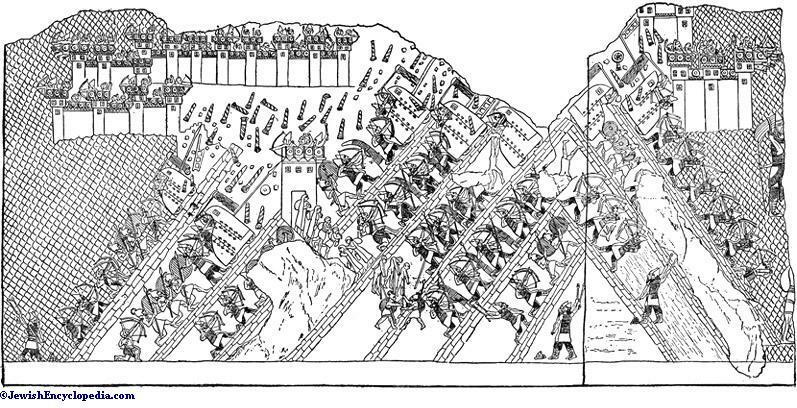 Siege of Lachish by the Troops of Sennacherib. The city of Lachish was located in Judah (Josh. xv. 39). It is first heard of in Josh. x. 3 et seq. Its king, Japhia, together with the kings of Jerusalem, Hebron, Jarmuth, and Eglon—all Amorites—formed a coalition against Gibeon because it had made peace with the Israelites. These kings were routed, caught in a cave, killed, and their bodies hanged. Joshua in this campaign besieged and captured Lachish (ib. x. 31, 32), and made prisoners also those who helped the city. Lachish is next mentioned in the list of cities built, or probably rebuilt, by Rehoboam (II Chron. xi. 9), the first king of Judah after the division of the kingdom. Amaziah, King of Judah, was so detested by his people that, to avoid the wrath of a conspiracy, he fled to Lachish (II Kings xiv. 19); but he was pursued and slain. Probably the greatest battle fought under the walls of Lachish was fought by Sennacherib's army in 701 B.C. (II Kings xviii. 14). While the Assyrians were besieging the city, Hezekiah sent and asked the price of forgiveness and absolute safety. The cost of such submission was quickly named, was collected by Judah's king, and sent to the King of Assyria at Lachish. From this same seat of war Sennacherib sent his officers "with a great army" against Jerusalem. 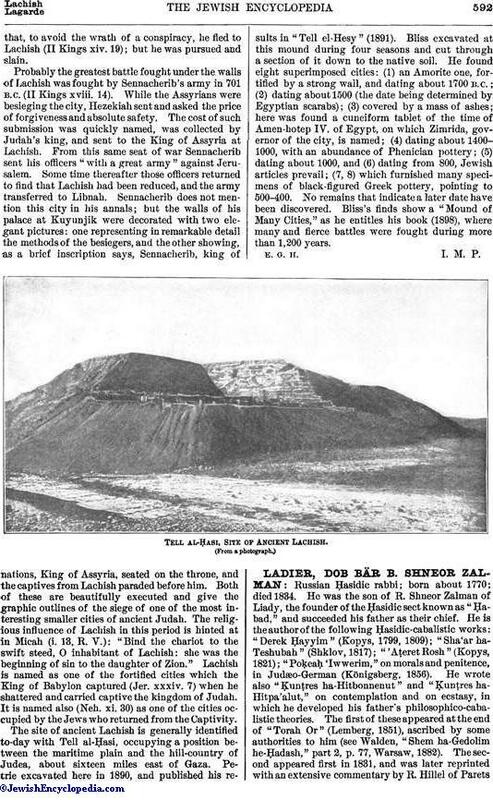 Some time thereafter those officers returned to find that Lachish had been reduced, and the army transferred to Libnah. Sennacherib does not mention this city in his annals; but the walls of his palace at Kuyunjik were decorated with two elegant pictures: one representing in remarkable detail the methods of the besiegers, and the other showing, as a brief inscription says, Sennacherib, king of nations, King of Assyria, seated on the throne, and the captives from Lachish paraded before him. Both of these are beautifully executed and give the graphic outlines of the siege of one of the most interesting smaller cities of ancient Judah. 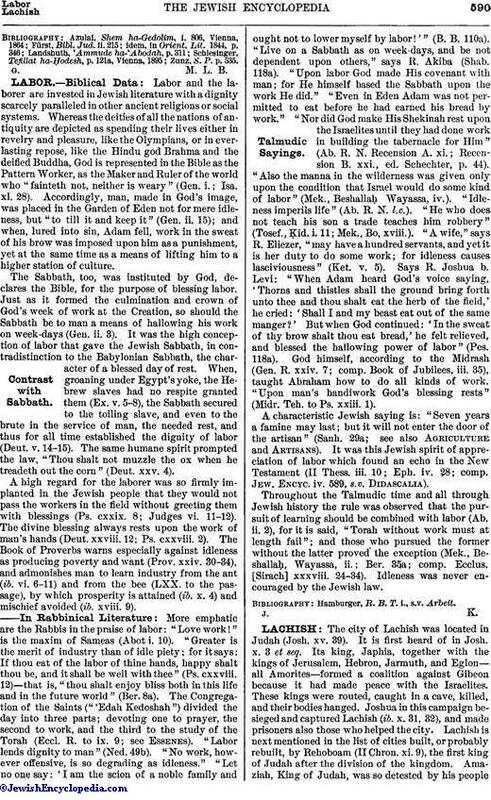 The religious influence of Lachish in this period is hinted at in Micah (i. 13, R. V.): "Bind the chariot to the swift steed, O inhabitant of Lachish: she was the beginning of sin to the daughter of Zion." Lachish is named as one of the fortified cities which the King of Babylon captured (Jer. xxxiv. 7) when he shattered and carried captive the kingdom of Judah. It is named also (Neh. xi. 30) as one of the cities occupied by the Jews who returned from the Captivity. The site of ancient Lachish is generally identified to-day with Tell al-Ḥasi, occupying a position between the maritime plain and the hill-country of Judea, about sixteen miles east of Gaza. 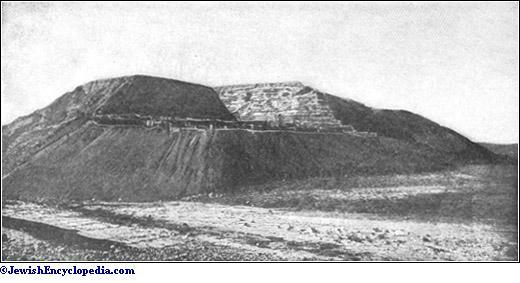 Petrie excavated here in 1890, and published his results in "Tell el-Hesy" (1891). Bliss excavated at this mound during four seasons and cut through a section of it down to the native soil. He found eight superimposed cities: (1) an Amorite one, fortified by a strong wall, and dating about 1700 B.C. ; (2) dating about 1500 (the date being determined by Egyptian scarabs); (3) covered by a mass of ashes; here was found a cuneiform tablet of the time of Amen-hotep IV. of Egypt, on which Zimrida, governor of the city, is named; (4) dating about 1400-1000, with an abundance of Phenician pottery; (5) dating about 1000, and (6) dating from 800, Jewish articles prevail; (7, 8) which furnished many specimens of black-figured Greek pottery, pointing to 500-400. No remains that indicate a later date have been discovered. Bliss's finds show a "Mound of Many Cities," as he entitles his book (1898), where many and fierce battles were fought during more than 1,200 years. Tell al-Ḥasi, Site of Ancient Lachish.